A century ago, the fur trade had nearly wiped out sea otters in California; only a few dozen survivors remained along a rugged and isolated stretch of the Big Sur coast. Since then, conservation efforts have helped the population rebound. “All otters that exist in California today, maybe around 3,000, descend from that tiny group,” Annabel says. What genetic diversity remains, of a population that numbered more than 10,000 animals before the fur trade, flows from those few Big Sur otters. In the effort to better understand the impacts of that “population bottleneck” and what it will take to help southern sea otters return to their historical numbers and range, Gidget’s contribution is foundational. The process began with a routine exam at the Aquarium. Our veterinary staff took samples of Gidget’s blood and quickly froze it to keep its long strands of DNA from breaking down. It was then shipped overnight on dry ice to Annabel’s UCLA lab, where she set about translating its genetic code into a mountain of digital puzzle pieces. Printed out, the complete genome might fill a stack of phonebooks three stories high, making sifting through it all and teasing out patterns a colossal challenge. Annabel says that’s compounded by the possibility that much of it is “junk DNA” that doesn’t code for anything meaningful. The more relevant DNA passages contain blueprints for specific sea otter building blocks: the proteins that comprise a whisker, for instance, or part of a paw or a furry belly. It’s possible to recognize some of these sections, thanks to earlier work sequencing mammals with similar DNA—particularly ferrets, otters’ mustelid cousins. 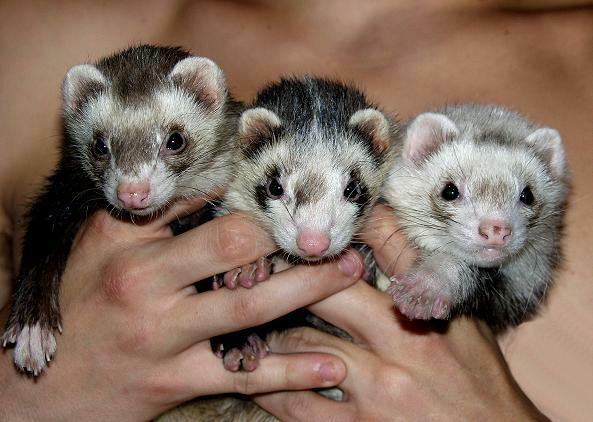 Earlier work sequencing the DNA of other mustelids, like these domesticated ferrets, will help researchers identify similar code in sea otter DNA. 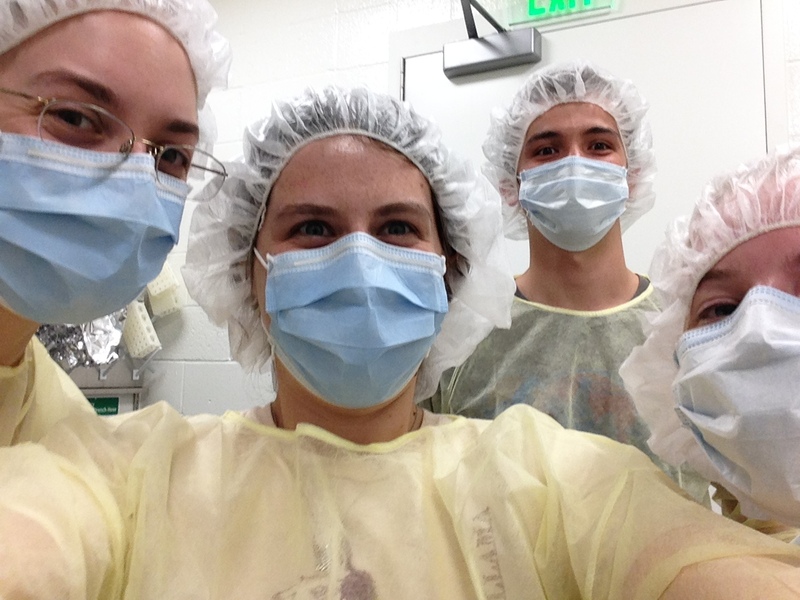 “Something that codes for an important protein isn’t going to necessarily change much from an otter to a ferret,” Annabel explains. From an evolutionary standpoint, otters have more in common with ferrets, weasels and badgers than with other marine mammals, like seals. Still, deciphering how a complete genome fits together requires considerable computational firepower. “Picture 50 computers all working together for weeks on end, devoting all their energies to this,” she says. A section of DNA code that, in its entirety, maps the sea otter genome. Once that “de novo genome” assembly is finished, and she has mapped which parts of the DNA code for proteins, it paves the way for much easier comparison among other sea otter specimens. “Instead of having to sequence the entire thing again, we can pull out the sections we’re interested in—maybe 3 to 5 percent of the genome,” Annabel says. Andy Johnson, who’s managed the Aquarium’s sea otter program for about 20 years, says the recovery of wild sea otters in California seems to have hit a wall in recent years. 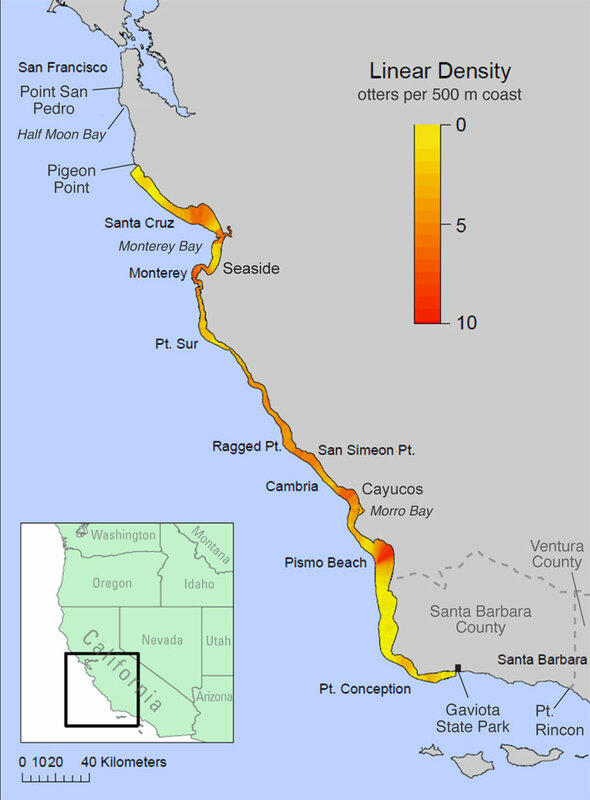 California sea otters’ current range along the Central Coast is a fraction of the area they historically inhabited. To grow their numbers, they need to expand farther up and down the coast, back into what are now otter-free portions of their historical range. Sea otters can currently be found only from Point Conception to around Half Moon Bay. “If the otters aren’t able to expand their range, what are the implications, and is there anything we can do about it?” Andy asks. 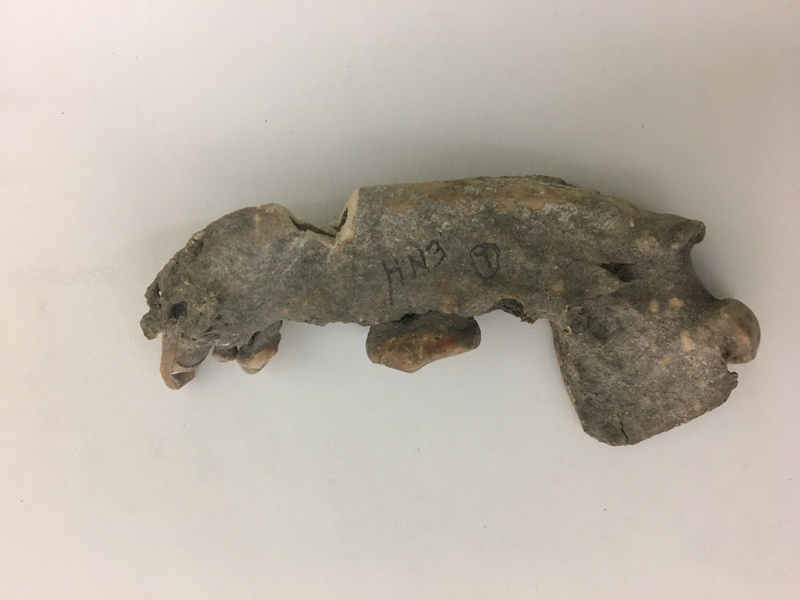 “Some of Annabel’s work will help us understand this better,” particularly where it involves looking back at ancient DNA samples and seeing what traits might’ve been lost from the era when otters were more abundant, before the population bottleneck. 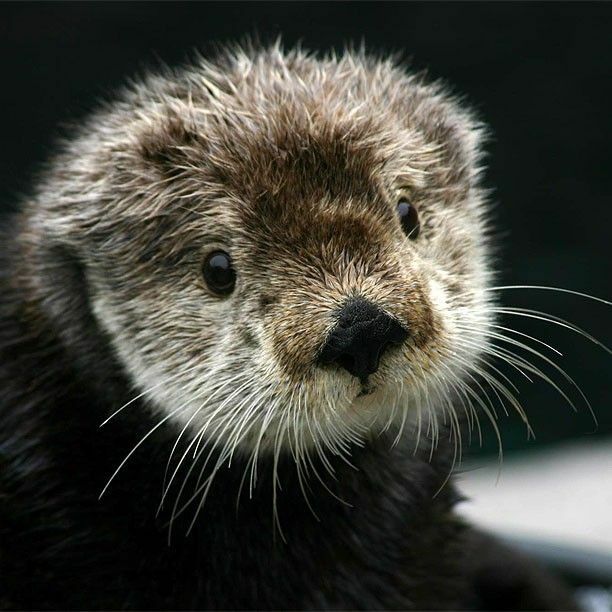 Annabel can track qualities that have gone missing from the modern-day sea otter population by comparing present-day DNA against ancient samples, called aDNA, dating back more than 2,000 years, when Native Americans hunted otters for food or pelts, and left behind their bones. Those bone piles, called middens, can be excavated and dated. Sometimes they contain hidden troves of aDNA, often inside teeth. 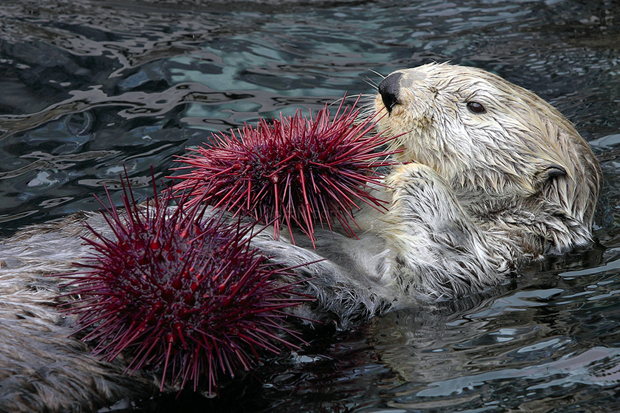 Sea otters contribute a cascading benefit to coastal ecosystem diversity, Andy says; he contrasts the example of the Aquarium’s iconic kelp forest exhibit with what he calls “urchin barrens.” Otters gladly dine on sea urchins; in their absence, an unchecked urchin population can devastate a kelp forest, undermining an important nursery habitat for many other species. That outsize role as “ecosystem engineers” is what makes Annabel’s research into the genetic history and traits of sea otters so vital, Andy says. For Annabel’s part, she’s “charmed” to have Gidget as an ambassador to the public. Learn more about our work to recover California’s threatened sea otters.